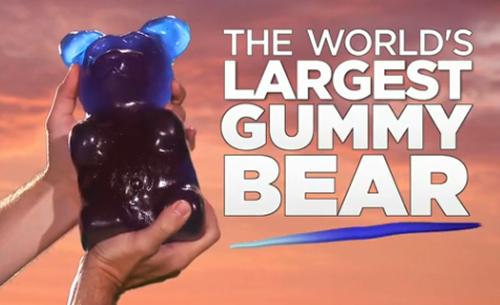 After I blogged about the mini gummy bear, JustJenn told me about this huge gummy bear. I have to say I am pretty enamoured with the thought of this 5lb gummy bear. 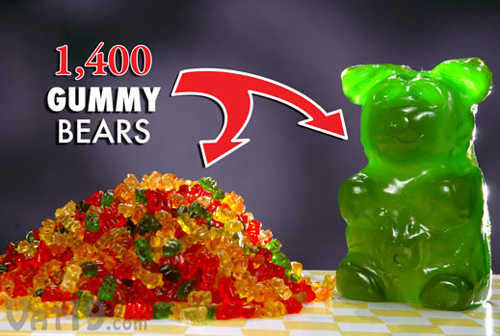 It is equal to 1,400 regular gummy bears and is 12,600 calories. You gotta watch this video about the huge gummy bear. It is hilarious! Ahahaha. That's creepy! It looks like a gummy baby. I think a gummy Domo would be cool. Then someone could pose a giant Domo eating a regular-sized gummy bear. Eww eww eww! I get nauseous just looking at it! Ok. The fork and spoon did it. I am truly disgusted and sorry I showed this to you. It reminds me of the original Willy Wonka. I think that a few giant gummy bears in that scene with the river of chocolate and candy trees.